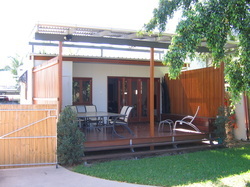 At All We Do Is Decks we are specialists deck and patio builders. Our extensive experience and expertise in design, drafting, organisation and construction ensure quality, durability and pleasing aesthetics in all of our decks and patios. Our services are many and varied with some examples listed below. Please visit our Gallery to see more examples of our work and the variety of work that we successfully complete. This deck in New Farm was a real challenge. The brief including attaching to the existing workers cottage with integrity, creating the proverbial outdoor room, vaulted ceilings and accommodating a carport area under with very limited turning space. The use of steel in the sub structure was integral in the design of floating the stairs over the driveway to cater for the car movements. The owners were clear in their desire to have the hand pitched, exposed timber roof and a seamless transition into the house proper. 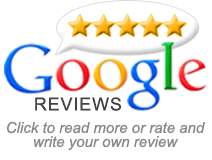 The result was a build that we thoroughly enjoyed as much as the owners were with the result. Factory manufactured insulated roof systems are an increasingly popular choice in roofing. They offer exceptional spanning capability, low maintenance, climate control and a stylish aesthetic. Electrical features including fans and down lights are easily accommodated. 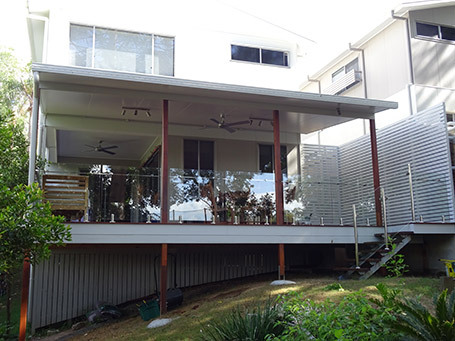 This steel framed deck with a glass balustrade in Auchenflower demonstrates a very modern style. The glass balustrade maximises the city views the property enjoys and a wooden slatted privacy screen extends around the corner to create a small stainless steel topped bar area appropriate for a couple of bar stools. The overfly roof allows plenty of light and breeze into the area. In addition to class, there are many other different types of balustrades that you can choose from. Here is a pool deck we completed in St. Lucia which complimented the existing pool and surrounds nicely. A well finished pool deck can certainly give your pool a new lease on life. 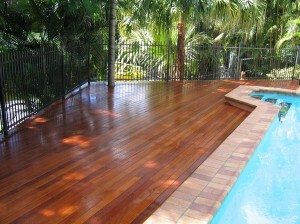 More information available on pool decking. 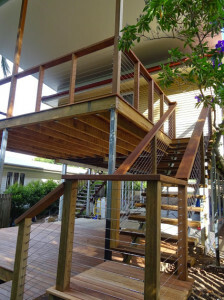 Balustrades are a large component of most decks and choosing the right one really helps to create the desired style. Choosing your balustrade is an important decision and we can offer you any type you want including glass, marine grade stainless steel wire, powder coated aluminium, and varying timber balustrades. 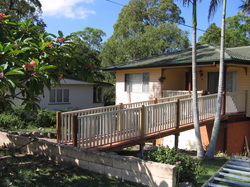 Screening is also a particularly important part of many Brisbane decks with most requiring a shield from neighbours and or the elements. We build many styles of screens and also source and install ready made or custom built screen panels. Building a staircase requires precise measurements and careful calculations. Stairs must satisfy strict building codes to ensure safety and climbing comfort. We have a huge wealth of experience in this arena and can help you create the look you’re after whilst adhering to the building code of Australia. The owner of this Stones Corner workers cottage wanted to open up the rear end of her home onto a private deck which could house a small european laundry. The block is small and the neighbours close making the privacy screens essential. We installed a 5 panel bifold door alongside a bifold servery window from the kitchen allowing plenty of light into the living area. The overfly roof ensures light and breeze flow into the house. The exterior cladding of this home was in extreme disrepair and required replacement. A waterproof outdoor cupboard equipped with laundry sink, washing machine hose connections, power points, a light, shelving, mop and broom hangers and space for a washer and dryer was installed in one corner. As an after thought our client requested some bench seating with storage inside. We installed these along the length of the privacy screens. 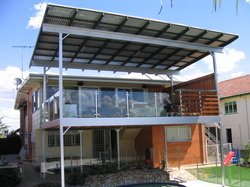 Here is a deck with a custom made insulated roof system we built in Tarragindi. The client wanted to use exposed ironbark rafters as a key detail. High grade insulation was sandwiched between trim deck on the top side which allowed for a flatter pitch on the roof and gyprock for the underside. The result was a very contemporary and stylish look. 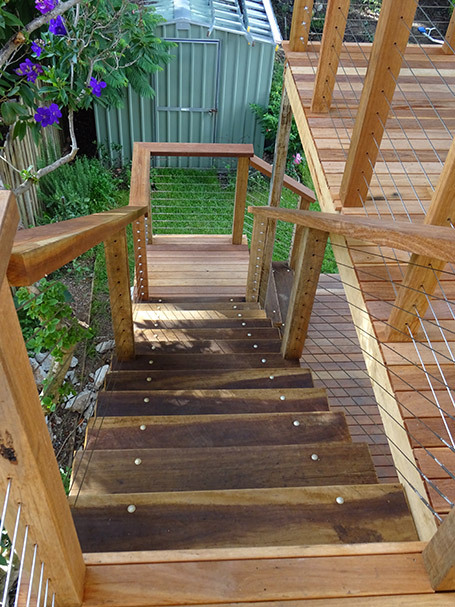 This timber walkway was created for a client in Everton Hills. She required easier access to her home from the street. This style of walkway can be used in many ways for functionality and aesthetics. 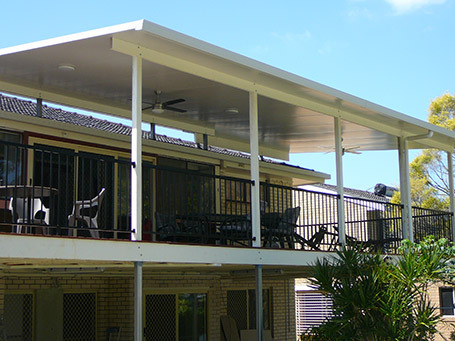 We were asked to plan, design and build this deck in Wynnum Manly to incorporate the existing roofline of the house, to make sure it didn’t look like an afterthought and build on a budget the owners were comfortable with. With some very minor adjustment we were able to pull the exact roofline of the house out over the deck and created a wonderful space for the family to enjoy. 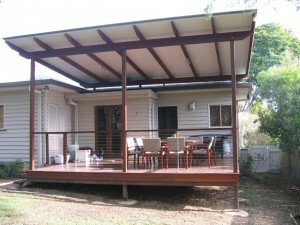 As a specialised deck builder we are experienced in building decks with a wide variety of materials. There are pros and cons related to each of the various decking materials and we are happy to advise you and assist you in your choice. Whether you are looking for a hardwood deck, an eco deck or a softwood deck (treated pine decking) you can be assured with All We Do Is Decks we can tailor a deck or patio to your needs, your lifestyle and that complements your home. 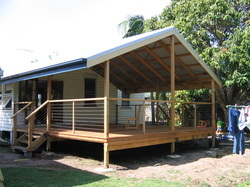 FYI we build hardwood decks in all the popular hardwood timbers including jarrah decking timber, spotted gum decking, blackbutt timber and merbau decking.